A lovely example of the traditional cast-iron teapots known in japan as tetsubin, this pot with its delicate, hand-cast, raised design highlighted in black is not only prized as a collectible, but also brews 20 ounces of tea perfectly. Its interior is glazed in enamel, so it won't rust or corrode, nor will its stainless-steel infuser. To make soothing, full-flavored tea, simply spoon loose tea leaves into the infuser, pour on simmering water and allow to steep for three to five minutes. The heavy cast-iron construction retains heat so well, it ensures second cups will still be hot. This cast iron tea pot set is in green color the set includes: 1 tea kettle (7.5" Dia. 3.5"H), 20 oz. 2 tea cups (3"dia. 2"H) 1 removable stainless steel infusing basket. 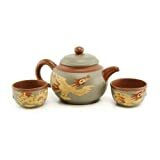 3 PC tea set. The Hamilton Beach Stainless Steel kettle is a beautiful and functional appliance for the kitchen. The 1500 watts brings water to a boil rapidly. The cordless feature allows you to take hot water to the table safely. The autoshutoff feature helps eliminate hazard. Heat water up to 50% faster than traditional tea kettles with the Osiris stovetop water kettle. The specially designed base is built to focus the heat and assist in boiling water faster. The Osiris water kettle is a true example of combining design with functionality. Old Dutch Stainless Steel Windsor Whistling Teakettle, 3 Qt. 3 Qt. Stainless Steel Whistling Tea Kettle. This classically styled kettle features a unique whistle mechanism hidden in its cover! Made of durable Stainless Steel, with a black wood handle & knob. 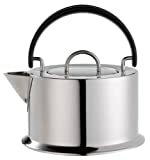 Royal 1.5 Liter Stainless Steel Cordless Electric Hot Water Tea Kettle - Boil Water Fast & Easy! Make the perfect cup of tea with this Oster Digital Electric Kettle. Easy to use controls allow you to set the kettle to any one of 11 temperature settings from 110-212 degrees Fahrenheit. The brushed stainless steel finish gives this kettle a modern look. Featuring an automatic shutoff, a hinged locking lid, a power light and a water window, the kettle stores up to 1.7 liters of piping hot water. 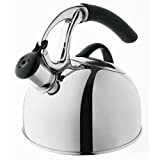 Oxo good grips, 2 QT, stainless steel, uplift teakettle with neoprene handle, lift the kettle by its handle & the spout cap opens automatically for easy pouring, large opening for easy cleaning & filling. This product adds a great value. Product is highly durable and very easy to use. This product is manufactured in china. 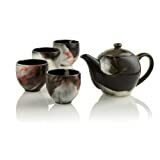 This Japanese stoneware set has unique reactive glaze which changes on each set once the heat of the kiln comes into contact with the pieces. A lovely example of the traditional cast-iron teapots known in japan, this pot with its delicate, hand-cast, raised design in highlighted in blue is not only prized as a collectible, but also brews 20 ounces of tea perfectly. Its interior is glazed in enamel, so it won't rust or corrode, nor will its stainless-steel infuser. To make soothing, full-flavored tea, simply spoon loose tea leaves into the infuser, pour on simmering water and allow to steep for three to five minutes. The heavy cast-iron construction retains heat so well, it ensures second cups will still be hot. 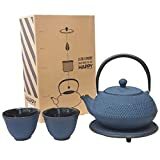 This cast iron tea pot set is in blue color the set includes: 1 tea kettle (6.5" dia. 2.5"h), 20oz 2 matching black tea cups (3"dia. 2"h) 1 removable stainless steel infusing basket.